George North is unlikely to play in Wales' first World Cup warm-up against Ireland on Saturday - but could make his return in Dublin on 29 August. The British and Irish Lions wing, 23, missed the final 10 weeks of last season after suffering his third concussion in a five-month period. 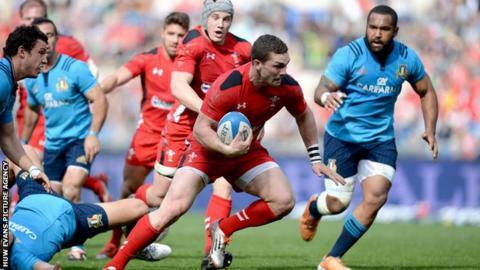 "I wouldn't have thought he will be involved this weekend," said Wales skills coach Neil Jenkins. "I'm sure three weeks down the road he could well be involved in Dublin." This Saturday's game takes place in Cardiff - and Jenkins added of North's prospective return: "We will wait and see how things go over the next couple of weeks." Liam Williams, 24, is unlikely to feature in any of Wales' warm-up games, with Italy on 5 September to follow after the two Ireland games. But the Scarlets full-back or wing is expected to be fit after foot surgery for the opening World Cup game against Uruguay on 20 September. "We certainly think he should be fit and available for the World Cup," confirmed Jenkins. "He's doing pretty well, doing the odd bits and bobs with us [in training] and seems to be progressing well. The 47-man Wales squad will be reduced after the first Ireland match to between 36 and 38, with the final 31-man squad due to be announced by coach Warren Gatland on 31 August.